I know at least one person who never thought I would survive. I would add myself to this number on many days. Much of my journey was not meant to build me up. I would add that some of this was unplanned. People and processes that could be considered helpful were not. I considered myself alone when I clearly wasn’t. I had family at my side and helpers in front of me but I was alone in my pain. In the midst of this, most of my thoughts involved giving up. I had one plan where I would never be found. I had one good reason but I also wanted to spare people the finality. I’m thankful I did not carry out this plan as my family would still be wondering or worse waiting. I did not disappear and I am doing my best not to be invisible. I find great comfort in being at home. I have space and views, privacy and quiet. I lost a couple of my homes and have lived for years without any of the above. To have all this again is really enough. I once owned properties, now I rent. I used to have mutual funds, now I have a checking account. 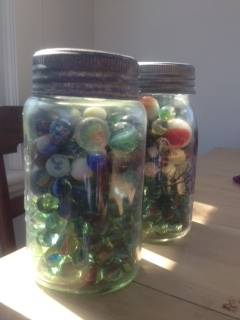 I had several valuable collections, now I have two glass jars full of marbles in my kitchen window. Marbles for me (and Toodles) are my happy thoughts. It started out that in the absence of my children I carried one for each. I found another marble in the basement crawlspace and added it to my pocket. When I had four or five they would become obvious when using change. I would often joke and say to anyone who asked that I in fact had all of my marbles. Most were without which greatly helped my self-esteem 🙂 As I got more marbles I would add them to a glass jar. I wasn’t aware of it but I was collecting happy thoughts. When my neighbours moved they gave me enough to fill another jar. It was fitting as they were two that made my transition into the community better. When I’m worried or even not thinking I sometimes fidget with the few in my pocket. They sometimes fall about but I have others to replace them. I would wish for anyone reading this to have as many happy thoughts as Toodles and I. I dare you to put one in your pocket and see if anymore turn up. We should all own at least one happy thought. Brett, this post gave me such joy for many reasons. First and foremost, I rejoiced that through all of the adversity you have faced you could have happy thoughts and have come to recognize the true joys of life like being at home. I know that joy too. Chuck and I are some of the people in your life who are very grateful that you did not disappear and think that the world has much to gain from you not being invisible. I know that we do. Thanks for checking out my blog and for taking the time to comment. You and Chuck were part of the “home team”. I see you as walking with me on parts of my journey. I guess that is what defines a friend, someone who is willing to trudge through and witness the tough terrain. It didn’t alter the terrain but it made all the difference.